My Low-Carb journey began back in 1998. You can find my full story, weight loss diet journal and before and after pictures online here. I have made these public in the hope that they will be helpful to others on their personal path to slimness. If you are struggling with what to eat or need low carb products, low carb diet plans or low carb recipes then consider a few of these fabulous Low Carb Books and Cookbooks. For those of you who are just getting started, "Low-Carb" Diets are a high protein diet and are much lower in carbohydrates. It includes a moderate amount of Meat, Eggs and Green Vegetables and a limited quantity of Fruits, Seeds and Nuts (most foods with a low glycemic index). It excludes all high carbohydrate foods such as Potatoes, Rice, Grains (Breads and Pastas), Corn, Beans and Sugar. If it's "white" it's probably not allowed. Cauliflower is probably the only exception I can think of. 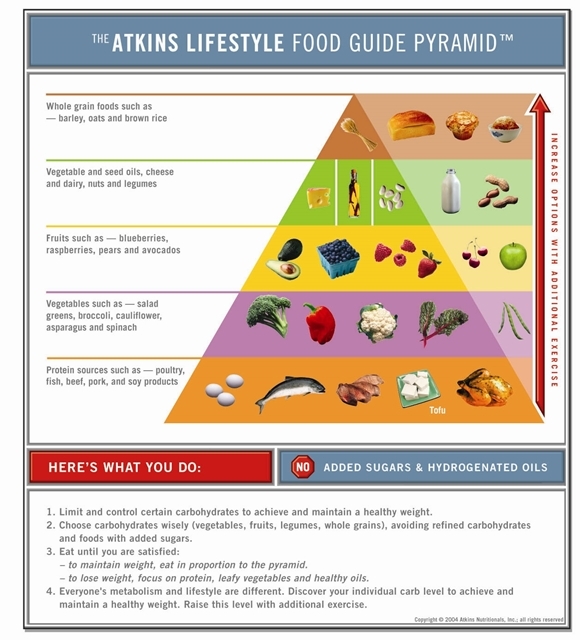 The most well known low-carb diet was introduced by Dr. Atkins back in the 1970s. Newer versions like the South Beach Diet have become very popular today. Proper nutritional supplementation can greatly enhance your low carb diet and facilitate easier weight loss. Some of the better used food and diet supplements are all natural vitamins, amino acids and herbs such as Vitamin C, Niacin, Fish Oils, 5-HTP and Glutamine. Carbohydrates stimulate the body to produce the hormone called Insulin. Insulin controls the movement of sugar from food into the cells of the body where it is then either used for energy or stored as fat. Years of excessive insulin production (Hyperinsulinemia) from eating high amounts of carbohydrates leads to a steady decrease in the sensitivity of the cells to insulin which in turn leads to the body having to make more and more insulin to get the same job done. This condition is known as Insulin Resistance and if left untreated it eventually leads to high cholesterol, heart disease, obesity and type II diabetes. Restricting one's consumption of high carbohydrate foods is the most effective way to control Insulin Resistance and the host of disorders and health problems which typically accompany it. Most low carb diet plans like the Atkins Diet and the Protein Power Life Plan etc. promote eating nutrient dense carbs like green vegetables and salads with moderate amounts of protein-rich foods like meat, eggs and cheese. The goal is to force the body into buring fat for fuel instead of carbohydrates. This is known as benign dietary ketosis. Although the emphasis is on counting "carbs" instead of calories, one does still need to consume fewer calories than one is burning in order to lose weight. See my Low Carb Foods list for more details on what to eat during the induction phase. The main difference with low carb diets is that the low carbohydrate intake will reduce hunger and appetite which makes it much easier to eat smaller portions than a regular low calorie diet. Low carb diets also gives you more energy thus making you more likely to want to exercise. So the bottom line is that you are not starving all the time. And the best part of it all is that this way of eating can be modified for maintenance when you are finished with your diet so that you don't regain your weight. Since Low Carb Diets have become so popular there are now many new Low Carb Products, Low Carb Snacks and Low Carb Recipes available to help the dieter stay on track. If you want to add variety to your diet and eat Low Carb Pasta, Low Carb Bread or Low Carb Cereal. Netrition has the largest selection of low carb products. They carry a full selection of Atkins Bars and Atkins Shakes. Their prices are competitive and shipping is very reasonable. If your weight loss has come along more slowly than you wanted or if you have stalled, you might want to check out my Stalls and Plateaus or Low Carb Tips pages as they may give you a few ideas on what might help you lose weight again. Some new things I've added to the site recently which you may find of use are the Carb Counts for common fruits and vegetables. There is also a Hidden Carb Calculator and a page about carbs in alcohol. Since I am not a medical doctor, please take a minute to read my legal disclaimer before exploring my site. If you have any questions about low carb diet plans that are not answered in my FAQ or other pages here, please feel free to E-Mail Me. If I don't know the answer I will do my best to find out for you. Eat and drink what you like.... living in America is apparently what kills you. Looking for something in particular? Use my site search box below to find it! The material posted here on Low Carb for Life should NOT be considered medical advice and is NOT intended to replace consultation with a qualified medical professional. Please consult a medical doctor before making any changes to your diet or medications!